Home › Home and Kitchen › Drinking Straw X-Chef Stainless Steel Beverage Straws With Cleaning Brush For.. Drinking Straw X-Chef Stainless Steel Beverage Straws With Cleaning Brush For..
ENVIRONMENTAL PROTECTION: The X -Chef Straight Drinking Straws are made of fine stainless steel, cyclic utilization, eco-friendly and money-saving. SAFE and EASY CLEAN: X-Chef Stainless Steel Drinking Straws are Dishwasher safe and easy to clean with the free cleaning brush. PREMIUM QUALITY: The X-Chef Stainless Steel Drinking Straws are designed Rust and scratch proof-18/10 stainless steel, never worry break it, rust it or transformed, one set of straws for a lifetime use, as long as you don't dissert them. Especially fits 20oz Yeti rambler tumbler cup and glasses. PLESANT SMELL: You may worry about tasting the stainless steel from these straws, feeling odd. But we guarantee you won't taste that, clean them with warm soapy water after you receive it, then you won't feel any smell of steel when you enjoy your juice,or other drinks.. GUARANTEE: X-Chef guarantees all buyers 100% satisfaction, once you find any problem of the product please feel free to contact us, we will solve it as soon as we can. All customers are guaranteed with 1 YEAR warranty. 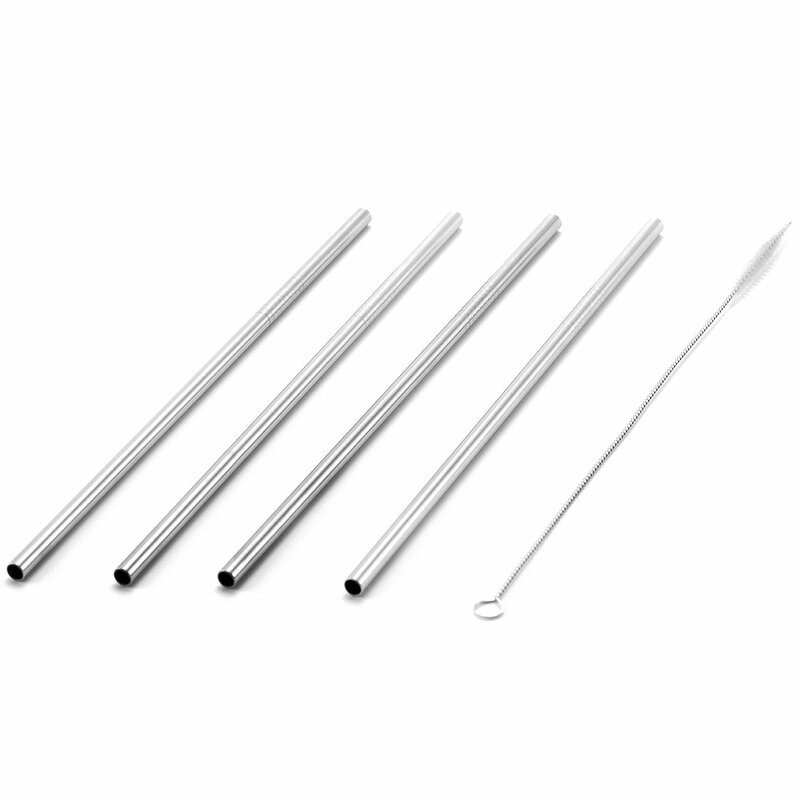 Drinking Straws, X-Chef Stainless Steel Straight Straws with Cleaner Brush for Juice milk beverage pack of 4 Better for Your Health These 18/10 stainless steel straws free you from the health concern thatyou've been wondering when you use plastic one. Plastic ones usually containtoxic chemicals like BPA, phthalates, etc. Food-safe stainless steel is muchbetter choice. Better for the Environment How many hundreds or thousands of plastic straws have you and your family sentto the landfill in the last year alone? Be part of the solution, not theproblem, and switch to a stainless steel straw that can be reused year afteryear. 18/10 Stainless Steel Won't Rust, Scratch, Chip or Break This strong alloy is exceptionally resistant to corrosion, wear and tear. Youcan expect it to look just as good years from now as when you bought it. Simple, Classic Straight Design Classic straight drinking straws, cool for business occasions or personalsimple lifestyle. Fits 20oz Yeti cups, glasses, good for drinks and smoothies.Can also be used as a leading straw for other liquids. Cleaning Brush Included These straws are dishwasher safe, but in case you want or need to wash them byhand, they come with special cleaning brush. Featuring a stainless steelhandle and nylon bristles, the brush is also the perfect size for cleaningcups, sports bottle and thermos straws.